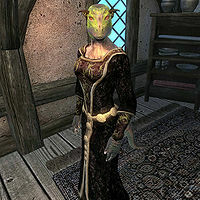 Seed-Neeus is an Argonian trader at Northern Goods and Trade in Chorrol. Seed-Neeus sells general goods and provides training in Mercantile. The unique Boots of the Swift Merchant can be purchased here and nowhere else. She loves her daughter, Dar-Ma, who is involved in the A Shadow Over Hackdirt quest. It is obvious Seed-Neeus cares deeply for her daughter because she will offer several rewards to get her daughter back safely. Seed-Neeus is also the person to see for upgrades to your house in Chorrol. She lives an uncomplicated life, never leaving her shop. She sleeps between midnight and 6am. She should only serve customers between 8am and 8pm, but the package she uses in her spare time causes her to open the shop the minute she awakens, and close it only when she goes to bed. And as if this wasn't enough overtime, during A Shadow Over Hackdirt she will stay up all night waiting for the return of her daughter, essentially offering services at all hours until the quest's completion. She wears a nice black & burgundy outfit and gold trimmed shoes. She also carries a green silk garment, a sizable amount of gold and the key to her shop. She will greet you as any decent merchant would: "Only the finest wares to buy and barter at Northern Goods and Trades. I'm Seed-Neeus, the proprietor. How can I help you?" If you ask her about Chorrol, she will point you out to other merchants in town: "If I don't have what you need, you might try the other Chorrol merchants. Renoit's has books. Fire and Steel for your armor and weapons." If you ask her about Dar-ma, she will reveal how proud she is of her daughter: "The best daughter a mother could ask for, kind-hearted and a friend to everyone she meets." As an advanced trainer of Mercantile, she can refer you to Palonirya to receive Master Training: "Palonirya is one of the wealthiest traders in Cyrodiil. Her shop in the Imperial City is so successful. If anyone can teach you more, she can." After Dar-ma's dissapearance, you can ask citizens of Chorrol about it: "Seed-Neeus is worried sick about her daughter Dar-Ma. If you think you can help, you'll find her at her shop, Northern Goods and Trade." When you speak to Seed-Neeus, she will ask you to help her out: "I'm [sic] don't mean to impose, but I'm hoping you can help me. My daughter, Dar-Ma is missing and I don't know what to do." If you ask her about Dar-ma, she will explain: "That's right, my daughter Dar-Ma never came back from Hackdirt. I'm dreadfully worried something may have happened to her. Can you help?" If say no, she will be disappointed: "Ah well, never mind then." Saying you'll help her will start A Shadow Over Hackdirt, and she will be very grateful: "I can't thank you enough for your kindness! She was supposed to make a delivery to Etira Moslin in Hackdirt, so I would start there. In case it may be useful, she was with Blossom -- her horse, I mean. Dar-Ma loves that animal, and would never willingly abandon her." She can give you additional information about Hackdirt: "A rather isolated village, south of Chorrol. We do some business with the trader there. Small volume, but she pays well. Normally I make the deliveries, but I wasn't feeling well so Dar-Ma insisted on going this time. I do hope nothing has happened to her!" Chorrol citizens may talk about Dar-ma's disappearance: "Did you hear that Dar-Ma has disappeared?" -"Yes, Seed-Neeus is worried sick about her. I hope nothing has happened to her. Sweet girl, but naive." At the end of the quest, when you tell her Dar-ma is safe, she will be ever so grateful: "Thank you, thank you! I can never repay you for your gift of my daughter's life, but you have my friendship and gratitude to the end of my days. ", after which you get 5 additional levels for Mercantile. She will afterwards occasionally greet you with: "I will never forget your brave rescue of my daughter. What can I do for you today?" Chorrol citizens may talk about Dar-ma's return: "Did you hear that Dar-Ma came back, safe and sound? You know, Seed-Neeus's daughter, the Argonians." -"Yes, Seed-Neeus was so worried. Nice to get a bit of good news for once, isn't it?" If Dar-ma has died, however, she will be devastated: "Oh, no. I had feared she might never return, but I had hoped for the best ... I ... thank you for your efforts ... please, excuse me ..."
The citizens of Chorrol are very pleased with her shop: "Northern Goods and Trade is an excellent place to buy supplies." or "I'm going over to Northern Goods and Trade. There's always something I need at that place.". She also gets a stamp of approval in Alessia Ottus' Guide to Chorrol: "she is clever, honest, and well-spoken. Isn't that remarkable? She is so acccomplished [sic] that she offers training in the mercantile arts, but you will not purchase goods from her cheaply." Esta página foi modificada pela última vez à(s) 00h45min de 23 de agosto de 2015.